If you are planning to build a website in the near future, knowing what a domain name is and how to register it is highly important. In a general sense, a domain name is used for identifying websites.It is basically an Internet Protocol (IP). Almost 300 million domain names were registered online in 2015 alone. Domain names in the Domain Name System (DNS) have different levels. The first level or top level domain names (TLDs) are .com, .edu, .info, .org, .net, .gov and country code domains (ccTLDs) such as .uk, .au and .jp. Next to TLDs are second level or third level domain names usually reserved for those who want to access the Internet through local area networks, create an Internet resource for public use or operate a website. These domain names need to be registered. Once registered, they can be hosted by domain name registrars (private entities that offer a range of hosting services for a fee). Remember that your domain name represents not just your website but also your company, the products or services you are offering, or the persona you are trying to project online. If you're following the checklist to choose a hosting company, then you must know having a domain is mandatory for hosting websites. A long domain name is not easy to remember. Some of the visitors are in a hurry to find information and would not be bothered to remember everything all at once. Having a long and difficult-to-memorize domain name is a huge turn-off to potential web visitors. If you want a short domain, those who wish to browse through your website would not have a hard time recalling the name. In fact, it might even be one of the first domain names that come to mind whenever someone asks for a recommendation in the future. Limit your domain names to a minimum of one word and a maximum of three words. If you intend to incorporate search engine optimization (SEO) strategies, however, two to three words would be ideal. Avoid using exotic or alien words that hardly anyone understands. If you have a specific range of products or services to offer, strange words will not give people any idea of what you are selling. Different digital marketers have different takes on the matter. While some people think that using .com as a TLD extension is already so outdated, many still hold it in high regard. If you are still trying to get your name out there, using .com instead of lesser known extensions is highly recommended. Why? Why? Well, .com is widely recognized and more accessible than other TLDs, so using it while you are still building your reputation can be a big boost. Tech savvy individuals may forget the use of .com since they have the technical know- how to market a website and generate traffic. This is not the case for those who are not tech savvy, however. Since .com has already built quite a reputation by itself, being a pioneer TLD in the history of domain names, non-tech savvy individuals can benefit greatly from its use. Of course, they have the option to use a different extension after their website gains a significant following. Earlier, you were warned not to use strange words for your domain name. That is because words that are not familiar to the ears have low marketability. The more familiar the words are, the easier it is for people to identify with your brand. Some of the most appealing brands are not only easy to remember. They also project a vibe or have connotations that people can relate to. Take advantage of familiar words so that people can have a positive perception of your brand. For instance, some drinking water brands always use the words “fresh,” “spring,” “natural” and “clean.” These words are easy to relate with and can be used as or added to keywords for SEO purposes. When the above steps are followed, the domain name registration can be done easily. Just when you think you have the best domain name figured out, you find out that someone else already registered that name and had sole dominion over it. Coming up with the best domain name is not as easy as it seems. You need to do your research, mull over your choices and ensure that you use a domain name your competitors have not yet used. In fact, if you have ascertained that no another site owner, person or company owns your chosen domain name, you must immediately consult a legal adviser and have your domain name trademarked. Lawsuits are very costly so always proceed with caution before naming your domain. You may already have a name in mind, but if you want your site to be friendly to search engines, you can add some broad keywords provided that it makes sense. Avoid being too generic, though, as this can lead to visibility problems. You have the option to target generic keywords that represent your brand and are easy to remember at the same time. Specific keywords are okay too but make sure they are marketable and do not sound too SEO-oriented. Although it is important to add an SEO perspective to your domain name, you should avoid getting caught up in the rules. There are many ways you can optimize your page and get more traffic, so it is not necessary to completely base your domain name on SEO strategies. 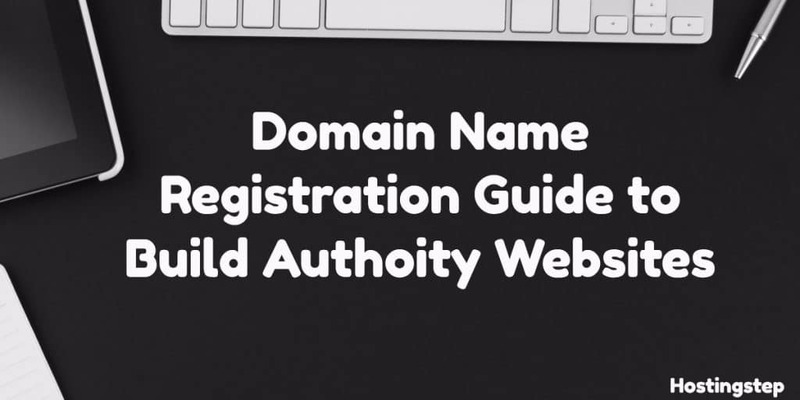 There are so many domain registration services online you can take advantage of. These registration services charge a fee. Some of the sites also offer hosting services for a specific duration, but you have the option to choose your subscription (e.g. monthly, quarterly or yearly). Here is a list of sites with domain name registration services you might want to consider, and I personally use Godaddy and Namecheap for hosting my couple of websites. 1. Namecheap – This site lives up to its reputation as a low-cost provider of domain registration services. The registration fee is less than a dollar per year. 2. GoDaddy – GoDaddy is considered the pillar of domain registration and web hosting, having hosted and registered millions of sites originating from different parts of the world. 3. Name.com – This domain registration site has operated since 2003. It remains to be a trusted provider of various web services including hosting, website building, and domain email. 4. UniRegistar – The services offered by this site focus on domain registration. Uniregistrar has registered over 3.6 million sites as of 2016. 5. Google Domains – Owned by the search engine giant, you can register and have your site hosted through Google Domains for a small fee the whole year through. This comes with a free email too. 6. Network Solutions – True to its name, Network Solutions lets you register your site and avail of various web services such as online marketing, hosting and website design and customization. 7. Register.com – Owned by Web.com, Register.com provides domain registration, lead generation and website builder and customization services for businesses. 8. Domain.com – For an affordable yearly rate, you can already register your domain, get a custom email, design your website however you want to and have your site hosted with Domain.com. 9. 1&1 – This site offers a range of web services from web hosting to domain registration plus a lot more. Registration fee per year is slightly higher than other sites but still less than a dollar. 10. Dynadot – Aside from domain registration, Dynadot lets you build your own site and take charge of the design. If you do not want to pay for hosting or buy a domain because you want to save money, then do not worry. Some hosting companies offer free domain names if you host your sites with them. Below is the list of companies offering free domain name if you host your website with them. You can check out our top recommended hosting companies which offer great uptime and response time.